The latest window of The Arvind Store (TAS) takes inspiration from the famous sketch of Leonardo Da Vinci to showcase the flexibility of the stretch fabric that they are offering. The window has been executed by Bangalore-based agency, Brand Connexions. When TAS decided to highlight its latest offerings in stretch fabrics through the show window, they decided to go minimalistic while creating a great impact for their pilot window at Jayanagar, Bangalore outlet. Taking inspiration from Da Vinci’s famous sketch, 'The Virtuvian Man', the window uses simple Sun Board with textured paint and raised LED lights. 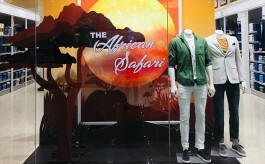 A single mannequin and graphics finished with vinyl and latex print finish the window. Talking to Retail4growth, Diptendu Saha, Head – VM, TAS, explained, “Coming from an art background, when I first got the story of next season merchandise which is based on stretched fabric - the first thing which came into my mind was the famous sketch of Da Vinci which reflects flexibility and stretched form of a human body. However, we wanted to keep the look of the window minimal to focus on the thought and not on many elements.” The window is slated to be executed rest of the TAS store across the country soon. 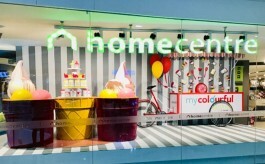 Bangalore-based agency Brand Connexions executed the window.